Here, where the Rhône and Saône converge, contemporary architecture embodies the city of the future. As Lyon's former industrial area, the Confluence district once housed the city's wholesale market, factories, prisons and the Port Rambaud, which supplied the city with goods arriving here via the river. Following the progressive closure of its factories in the late 20th century, the Confluence’s urbanisation project has brought a new breath of life to the district, and helped to extend the city in a southerly direction. Leading names from the international architecture scene, such as Christian de Portzamparc, Kengo Kuma and Massimiliano Fuksas, have added their own personal touches to the area's extraordinary architecture. As an area on the cutting edge of ecology and devoted to experimentation, this eco-district boasts a combination of structural daring and sustainable development. From the banks of the Saône all the way along the central avenue of Cours Charlemagne, shops, homes and offices cohabit with construction sites and renovations breathing new life into the former port buildings. 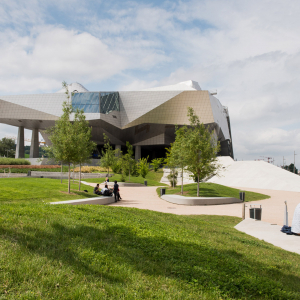 Discover the new and resolutely forward-looking face of Lyon!